Plain white rice can be so… plain. While that can be good for everything from digestion to how awesome it works with practically any other ingredient, it’s how it’s served that could use a little sprucing up. Especially when we’re talking about exceedingly cute hearts, stars and bears. 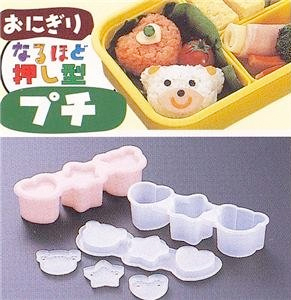 The Inomata Sushi Mold Rice Ball Maker transforms everyday boring sushi into exciting fun-shaped sushi you can play with. Place rice into the mold, cover, press and then push it out—your fish won’t know what hit it. Although that salmon nigiri might have an inkling when it sees that bear coming at it.